Accurate blood pressure measurements with the simple push of a button - no adjustments necessary. 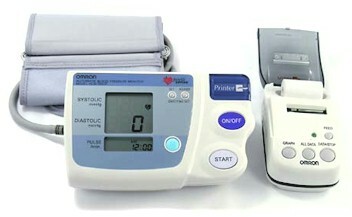 The Omron BP 710 Automatic Blood Pressure Monitor is the answer for those who have been looking for a simple, affordable home blood-pressure monitor they can trust. Lightweight and portable monitor displays blood pressure and pulse rate on large, easy to read digital display. Easy squeeze inflation bulb quickly fills cuff with air, and automatic deflation. D-ring cuff is easy to wear and according to experts from the American Society of Hypertension are the easiest to use. Keep accurate records of your blood pressure readings with the Blood Pressure Monitor and Print Out. Simply wrap the cuff around your arm and press START. In seconds, your blood pressure and pulse are displayed on the large digital panel. You can then print your readings in either numerical or bar graph form for easy record keeping. Although your blood pressure fluctuates throughout the day, no self-adjustment is necessary as the monitor intelligently adjusts to your changing conditions. The IntelliSense monitor uses fuzzy logic intelligence to sense both your systolic and diastolic blood pressure values, and the result is personalized inflation with every reading. Arm discomfort and misreading due to improper cuff inflation are virtually eliminated. 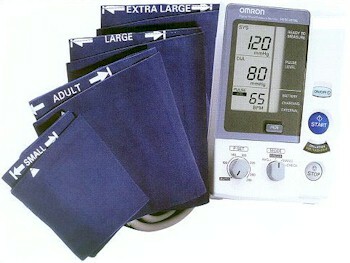 The Omron HEM-705 blood pressure monitor will operate with an AC Power Adaptor which minimizes the battery usage and allows for an optional method of operation. It also operates on 4 “AA” batteries (not included). Battery life is approximate 300 uses when used once a day for 2 minutes. The HEM-705 printing unit may be disconnected for storage or travel purposes.